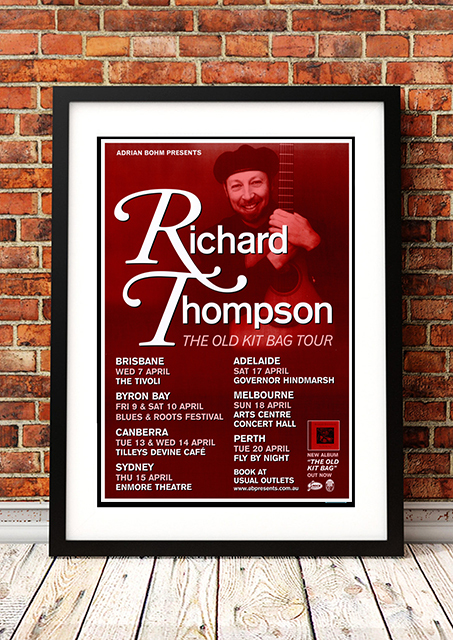 Classic Richard Thompson Band Concert Posters and Memorabilia! Buy Online Now! For years, Richard Thompson resided in relative obscurity, while at the same time garnering vast critical praise for his magnificent guitar work and the dark wit and richness of his extraordinary songwriting. A founding member of the seminal British folk-rock group Fairport Convention, he remained with the band for five studio albums — Fairport Convention(1968), What We Did on Our Holiday (released as Fairport Convention in the U.S.) (1968), Unhalfbricking (1969), Liege and Lief (1969), and Full House (1970) — and one live recording (Live at the L.A. Troubadour [recorded in September 1970, released 1976], reissued as House Full . In early 1971, Thompson, feeling that the material he had been writing at the time was not right for the band, decided to leave for a solo career. In between sessions and dates supporting former Fairport mates Sandy Denny and Ian Matthews, he entered the studio to record his first record, Henry the Human Fly (1972), which was a more idiosyncratic version of the British traditional rock & roll mix that he had begun with his old band. During this time, he also contributed to the rock & roll homage The Bunch (1972) as well as the traditional Morris On (1972), both of which featured various members, past and present, of Fairport Convention and their offshoots. None of these did anything to change the general public’s view of Thompson, to the point where Henry the Human Fly gained the notable distinction of being the worst-selling album in the history of Warner Bros. Records.We stock some awesome Richard Thompson Band Concert Posters.